The estimated results sheet is the sheet i find most useful. The formulas look at the results entered (must be at least 2 sets of data) and estimate the future trend of results. The formulas also update and recalculate with every new set of measurements. This is the estimated number of days over or under the deadline date that it will take you to achieve your goal. 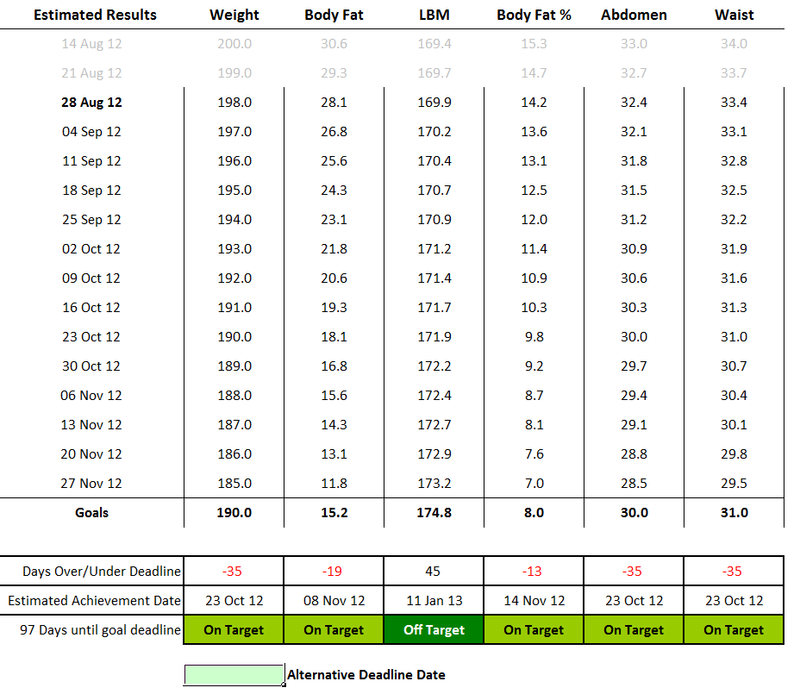 This is calculated by your current rate of progression and can change depending your results each week. Using the days over / under the deadline, this gives you an estimated date for the achievement of your goals. For simplicities sake, the boxes stating "On Target" and "Off Target" indicate whether you're on track to achieve your goals by the deadline. If you wish to change the deadline date, simply enter a new date in this box. Keep in mind that there are only 16 measurement intervals. Using the screen shot below as an example, if you were to input the 30th of December as your deadline and 14th of August as your start date. The sheet would only be able to go up to the 27th of November unless you changed the measurement intervals from 7 days to 14 days.